The Snapdragon 810 processor is only making it into handsets, but Qualcomm has already announced its successor in the form of the Snapdragon 820. It's set to reside inside its first smartphone in the second half of this year, so our eyes are on the Samsung Galaxy Note 5 as a potential receiver. The main focus of the 64-bit Snapdragon 820 SoC (system on chip) is its support for Qualcomm's Zeroth platform, giving mobile devices a new level of intelligence and personalization. This means the next generation of flagship smartphones will sport on-device cognitive capabilities, allowing them to learn more about their environment and your usage. 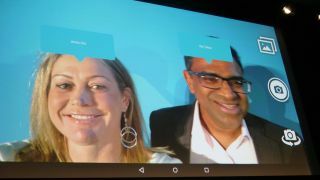 One example of the cognitive learning Qualcomm showed off at MWC 2015 was centred around the camera application. Your smartphone will be able to automatically detect the scene - be it indoor or outdoor, whether there are people in the shot, and if so who they are if they're a friend of yours, food products and even the fact you're wearing a watch on your wrist. The fact the camera can recognise your exact surrounding means it can select the best settings for your photo. The more photos you take, the better it gets at tweaking the settings. In total Qualcomm has programmed between 30 and 40 different situations for the camera into the brain of the Zeroth platform, but this is just the start. You can also expect to see the Zeroth platform move into other areas in the future, including the home and automotive, and it will be interesting to see just how smart it can get.